In part 2 we looked at how all of your samples are being mapped for triggering inside the Mapping Editor and how to add some effects to your samples inside Kontakt’s engine. One thing that is missing though is how to create the interface and how to layer everything for control. The easiest and fastest way to create the interface is to use a free GUI creator called Konstruktor by Will Bedford Music. You can download it HERE. It is a tool that works with Kontakt 5.1 and up and it allows anyone to create their own GUI without the knowledge of scripting inside Kontakt. The good thing about it is that it runs inside Kontakt so you can test it together with your instrument. 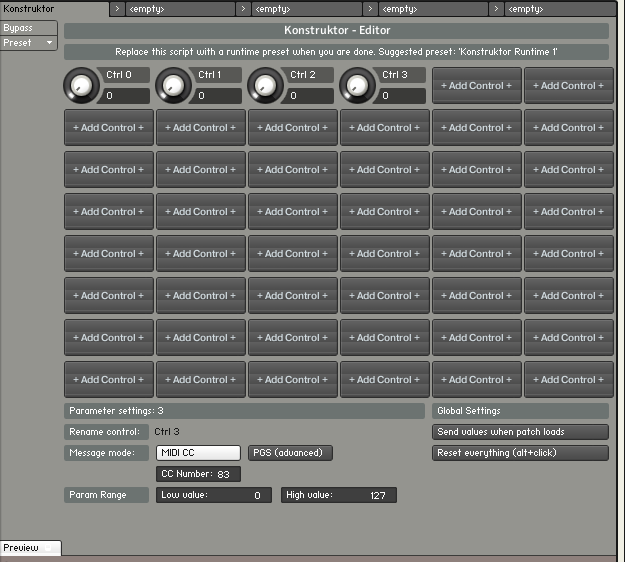 Konstruktor features 9 Kontakt scripts of various interfaces with different specs. 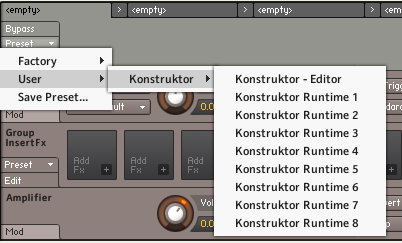 To install these presets you need to copy the Konstruktor folder to Kontakt’s user presets directory. To use Konstruktor in an instrument, first make sure the patch is saved and linked to a resource container (NKR) path, because this is needed for Konstruktor to store user interface data. 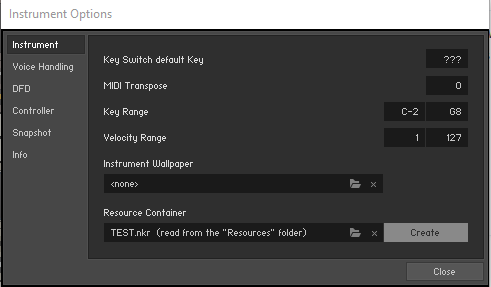 In order to load Konstruktor into Kontakt you need to click on the small wrench in the upper left corner of your instrument and click on the right tab on the far right where it says Script Editor. If you were successful in copying the Konstruktor files to the previously mentioned folder path, when you click on Preset tab in the left side of the interface you will see Konstruktor options in the drop-down menu. Select Konstruktor – Editor and then in the bottom left corner of the gray area of the interface, click on the Edit button in order to see the interface editor. Click on any of the Add Control buttons to add a control knob. Alt+Click on the knob to remove it. If you want to fully reset the interface to an empty template, hold Alt and click the Reset Everything button. The behaviour of each UI control can be customized by using the Parameter Settings section. The title display of each knob can be changed using the Rename Control option. The type of output message each knob sends can be set with the Message Mode controls. The output range of each knob can be specified using the High Value and Low Value options. To rename the knobs you simply click on the knob and in the Rename Control option just change the name. For example, my first knob is going to be used for reverb so I am going to label it as Reverb. I click on the knob and then just rename it next to where it says Rename Control. I repeated the same process for every additional knob I created and those are delay, drive and tape. Now I want to populate my instrument editor with effects for processing my samples. While still being in the script editor you will see the insert and send FX slots below your script editor. By simply clicking on Add Fx, you can select the desired effect. For my insert FX I selected Distortion and Saturation and for my send FX I selected Reverb and Delay. 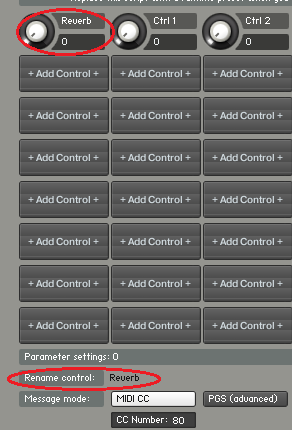 Now in order to assign the controls to my FX I choose the option of assigning the MIDI control simply by right clicking on the parameter of the FX I wanted to control. Make sure that your MIDI control data of the parameter matches the control data of the interface knob. In other words, simply repeat the process for both of the knobs and move the same midi control. I assigned my MIDI control to distortion drive knob and to the knob on the interface that was previously named as Drive. That way I am able to see how much distortion I am adding. For send FX you need to click on the Sends tab in the Instrument Insert FX tab to be able to see the controls for adding the send FX. In my case, those are reverb and delay. Repeat the same process for adding midi control data like I did for the Drive parameter. When you have finished building the interface use the Script Preset menu and load a Konstruktor Runtime module. Each runtime module is numbered from 1 to 8 which indicates the height of the interface and corresponds to the number of rows from the top that are occupied by controls. A suggested runtime preset is given at the top of the editor. Make sure that your instrument is previously saved as Patch+Samples in order to create the NKR file to which the GUI will get connected. To create the Resource Container go to the Instrument Options, select the folder where you want your resource container to be located, and click Create. After building the interface you may wish to load a background image and instrument icon. This can be done in the Instrument Options menu by selecting the wallpaper. And there you have it! Interface saved! Now you are ready to create your own instruments. Go make something inspiring.